In this series of articles, I'm suggesting that the time has come to help create a "Not-authoritarian, Not-capitalist" system: a Canadian Co-operative Commonweal as part of a Global Commonweal of Local Commonweals. "ownership" of higher-than-average paid-work positions, and their use for profit. To deal with these core aspects of capitalism, we must, first, return money to its proper use: as a lubricant of human activity, created by and flowing through nationally-owned, democratic, public service banking and financial systems. As a result, we can then convert workplaces into appropriate co-operative enterprises, such that each person has respectful co-stewardship of land and knowledge resources; so that everyone receives a fair, guaranteed income and we all embrace proper co-stewardship of the planet as our central life task. This would be a world, in other words, that is based upon the evolving Co-operative Values and Principles and Definition found in the Statement on the Co-operative Identity from the International Co-operative Alliance, published in the October issue of The Monitor. In the planet-trashing meat-grinder called capitalism, people are (expensive) "factors of production" to be eliminated wherever possible, or as profitable units of consumption, to be captured wherever possible. This is the main reason our planet has been so badly polluted and its non-renewable resources so irresponsibly plundered. No wonder so many of us feel so bad. Now, whether you wish capitalism to be replaced (as socialists do), or whether you wish to manage it more equitably and humanely (as social democrats of the left, right or centre do — foolishly, in my estimation); or even if you are a committed fan of capitalism who favours more regulation (or deregulation! ), you'd do well to know how it works. And that's what this second article in my series is all about. In the first part of this series, last month, we explored values and political mapping, which suggests that the co-operative socialist alternative to both capitalism and authoritarian leftism is located in the same place where the values system of present-day Canadians is also found. So I'm suggesting here that the concept of "Co-operative Commonweal" implies that we convert all workplaces into appropriate co-operative enterprises: so that every person, and every organization, has respectful, time-limited stewardship of land and knowledge resources, and that, as a result, true equality and sustainability are both created. the consequently-created culture of rampant crime, fear, debt, and insecurity. Thus, in a Co-operative Commonweal, each community will be in full, open, time-limited, co-operative co-stewardship of its economic resources: ensuring that they are used for the benefit of the whole of humanity, and for the benefit of the whole global ecology. Which brings us to the question of what capitalism is, so first, let's look at how wealth is created. [Note: If you are reading this as part of a study group, you might pause here and — collectively — try to list the resources that you'd need to set up a steel teaspoon manufacturing and marketing operation. Then, try to work out how the proceeds of the sale of those spoons would be distributed if the activity were set up as a capitalist "boss-and-workers" outfit, or as a co-operative socialist alternative: an equal-pay workers' co-op. Remember that capitalism uses the five mechanisms of economic oppression (theft, rent, interest, profit and unequal pay for work, for which the acronym "TRIP-UP" serves well). These five mechanisms comprise the ways wealth are distributed in a capitalist economy. For those using these articles in study groups, it would also be worthwhile listing those paid-work activities that provide higher-than-average pay: you'll be surprised how many start with the letter P! knowledge — the work of previous generations, in the forms of the hardware and software of "wealth production": machinery, patents, workplace know-how, and, indeed, any tangible or intangible holding of knowledge or information: "intellectual property," musical scores, "captured" images, and so on; the profits from the use of these resources are usually distributed to "owners" as dividends (and as the proceeds of sales of these assets after market inflation of their "values"). But first, since I'm a chemist (and have also been a businessman), my experience suggests that wealth (i.e., things of value through their use to humans) is created when value is added to a mixture of raw materials plus energy. If you think, for example, about making and baking an apple pie, you'll see what I mean. 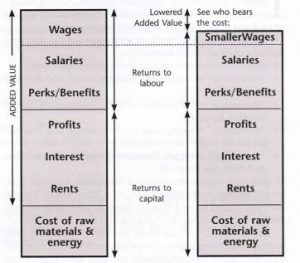 This step-wise analysis allows many other features of capitalism to be discerned: such as the inevitable suppression of wages and salaries; the ever-increasing spread of pollution, violence, and insecurity, and so on. The terms "earned" and "unearned income" might also be considered here. These seem to be culturally specific, highly politicized, much-muddled terms. "Unearned income is any income that comes from sources other than employment (work). Examples of unearned income include interest from bonds, savings accounts, and other sources; dividends from stocks; capital gains from selling investments at a profit; and income from rental property. Some unearned income is taxed at the regular income tax rate; other unearned income is taxed at a lower rate, often to encourage further investment. Proceeds from retirement plans and Social Security payments are also treated as unearned income, even though they derive in part from the earned income of an individual's prior employment. Gifts, inheritances, royalties, in-kind support, awards, and prizes are considered unearned income. As such, they are treated differently from earned income for tax purposes." Convert competitive, market-based activities into work­place co-operatives, and remodel monopoly activities as community co-operatives. Each co-op would demonstra­bly, operate according to the Co-operative Values and Principles of the International Co-operative Alliance and, from the commonweal and the planet, would have re­spectful, time-limited co-stewardship of appropriate land and knowledge resources. Distribute the added-value/created-wealth from these workplace co-ops through nationally collected, co-opera­tive corporate taxation, distributed into local, democrat­ically-controlled Community Banks, and so make money and credit available for eco- and socially-responsible wealth creation, community development, and global care. Maximize necessary service provision (health, education, libraries, transport, and so on) on a co-operative, free-at­the-point-of-use basis: retaining money only as a mecha­nism for access to discretionary purchases. Introduce guaranteed fair income for all, within upper and lower brackets: based upon a liveable, fair Citizen's Income, and so do away with the need for direct and indirect personal taxation — income tax, sales taxes, and so on. Abolish money-lending and credit-creation for profit, and so operate banking as a community-controlled, co­operative public service. Reintroduce international exchange controls, a Tobin Tax, etc., as necessary. All our sisters our brothers, and all our brothers our sisters — One in all, all as one, all in one. Make capital grants (not loans) to developing countries. I leave the readers and study groups to judge this definition: particularly whether it is equitable that some receive "unearned income" when most have to work for their income. Moreover, you could debate whether unearned incomes (i.e., rent, interest, and profits) are either necessary (for economic functioning), or even "beneficial" in terms of human equality or planetary well-being. Another study group discussion, perhaps? That's where the acronym TRIP-UP helps us remember the five mechanisms that capitalism uses to create inequality and trash the planet. TRIP-UP stands for Theft, Rent, Interest, Profit, and Unequal-Pay for work. the conversion, therefore, of an economic system based on "ownership and use-for-profit" (i.e., capitalism), into one based on responsible co-stewardship of the commonweal (a co-operative commonweal), and of use, only, for that end. In practical terms, this is evolving into The Fair World Action Plan, which appears above.